Chi Energy Cultivation in Moderate Levels is Key whether you have a Qigong or Chi Energy cultivation practice. For it is the practice of healing and bringing into balance emotional composure finding this is the essential building block for good health. 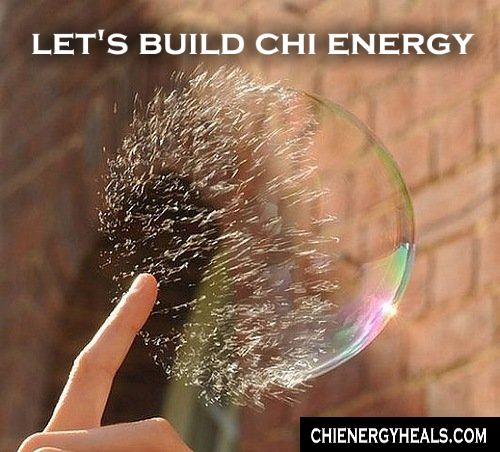 In the School of Chi Energy, we ask our students to build high levels of chi with a good feeling and cool temperature type of bioenergy. The advantage of orchestrating emotional balance while building chi or bio-energy for this specific type of practice are the direct and positive physiological benefits that occur in the body. In this article we’ll provide three of the leading health benefits from building chi or bio-energy in the body with emotional stability along with some biology-based principles that are behind this type of method. Starting any type of exercise with the proper attitude especially an exercise that builds high levels of bio-electricity in the body releases a hormonal response that lays a foundation for long lasting behavioral changes. It is this specific chi building practice of using a good feeling cool energy that releases these stress reducing hormones which are the key to great health. A chemical reaction occurs when we feel free from past or future concerns. It is what we holistically call the mindfulness moments of our life that floods the blood stream with the right hormones that regulates our metabolism and immune system. First: A relaxed good feeling attitude with a genuine smile brings out the serotonin, melatonin, dopamine and cortisol hormones in the right mix for an anti-inflammatory environment for the body to enjoy. As the chi practitioner builds up the bio-energy in the nerve fibers with these types of hormones, the body automatically slows down the aging process, increases energy levels and fortifies great emotional habits. Second: The physiological changes all come about with right mind intent. How we move our mind or act our way into the feelings of well being determines what chemical reactions our body is going to produce. Our mind’s intent should be to build chi that invokes a moderation of emotional content. Building up bio-energy in the nerve fibers in this way creates a well being feeling that keeps reproduces these good hormones in a balanced amount. Third: This moderation is the key to a sound and healthy outcome for a chi practitioner’s mind and body. A sound mind and body has the benefit of having plenty of reserves to handle peak loads of stress when called upon. Stress does not build up in the body due to the reserves of Natural Killer and T-cells. It is scientifically proven that only when a person maintains this good feeling mood that NK cells are present and patrolling in the body on the offense before any trouble builds from high amounts of stress. Bonus: Learn Mindfulness and Relaxation. Please use the below link to listen to before your Healing Energy Practice and while working on the computer. Our Chi Energy Instructors at their Advanced Levels, experience a ‘Unique’ difference with breathing and meditation which forms into 3D Bio-Energy Circuits. Chi Energy practitioners are always on their game when following the rules of moderation. We at the School of Chi Energy have found that bio-energy is best developed by maintaining emotional stability for moderation is the key.